As we woke up this morning there was a difference about the day. One, it was cool. About 47 degrees and there was very little sun thanks to a smokey haze that hung over what seemed to be Gardiner but what I am sure was more or less the whole park. Idaho is experiencing some pretty bad forest fires right now and a lot of the smoke from those fires is blowing over this way. Although it does damper some of the spectacular views of Yellowstone, it actually helped keep the day in the cooler range. Jeff and myself had decided we wanted to fish 100% new water before our guest arrived. 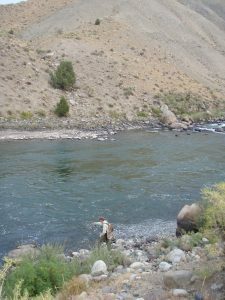 So staying with that theme we decided to fish a section of the Yellowstone in the park, After a couple mile hike in, and witnessing some of the before mentioned spectacular views. 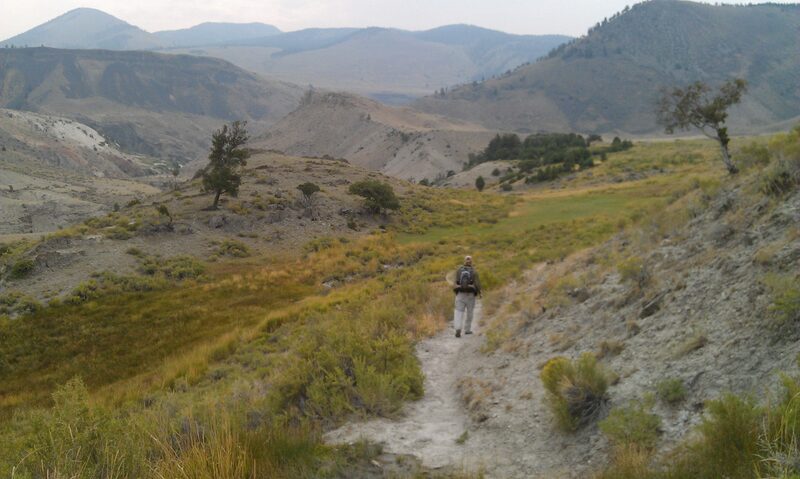 we dropped down into the river valley to fish the Yellowstone. The water is low this year compared to the past several, but still yet it was full of water and moving. Most of the time when I fish big water I like to cast to the banks and try to catch the fish holding near the structure on the shore, but today that was not the case. We tried it of course, and found a few, but the majority of the fish were holding around the structure in about 15′ of water. Longer cast were needed and bigger mends. 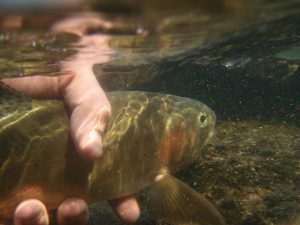 Fish were not afraid to come up in fast currents as well. We were throwing hoppers, caddis, rusty spinners, and stoneflies. Each one had their time but the big winners were hopers, Rusty spinners , and Stones. While we were having fun fishing there was evidence of someone else who had been doing the same. We also saw and Osprey soaring over the river on the prowl for it’s next sushi meal. Yellowstone is a place of extremes and you never know what you will see. For instance, even the ants are extreme. Saw this guy crawling around in the rock son shore. All the fish were absolutely gorgeous with shoulders and the knowledge to take you into the curent. We fished until we couldn’t fish any more. Seriously the canyon wall wouldn’t let us past. After our hike out and on our way to dinner we ran into a Gardiner traffic jam. This guy shook his head at Jeff. Tomorrow we are taking a day off from fishing to get ready for our guest to come into town. 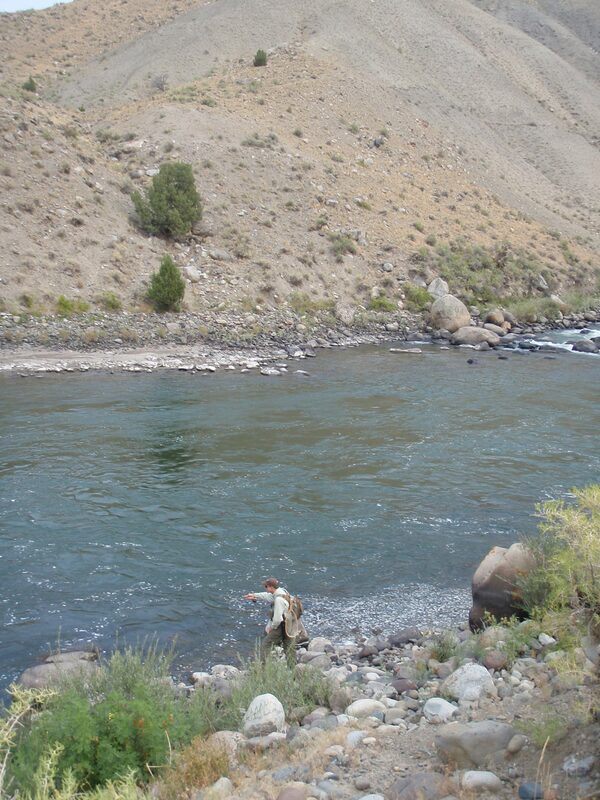 Check back with us to keep up on the fishing in Yellowstone.